Texas BBQ has a common menu. Chicken is always on the menu. It is usually served as a half of bird, grilled golden brown and offered with a drenching of BBQ sauce. There is always some beef option. Rarely is the an option of beef ribs. 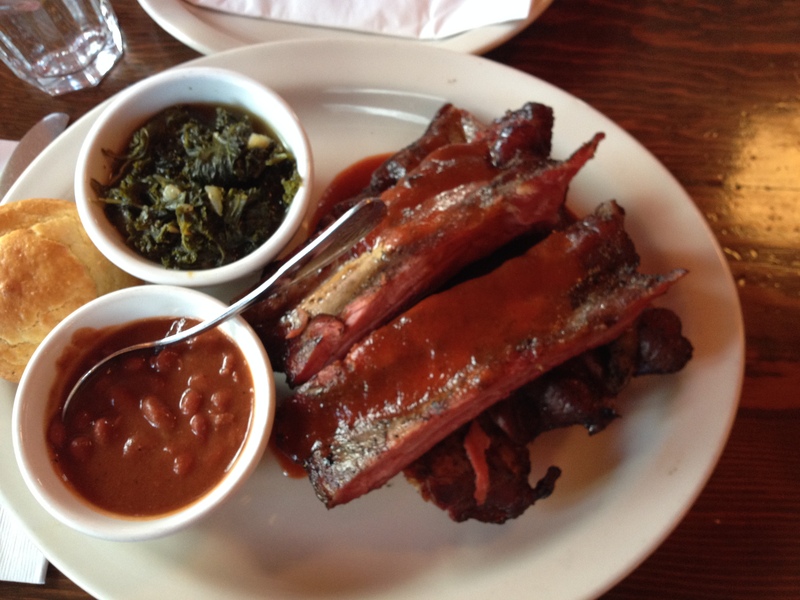 While it is Texas and beef is common here, beef ribs are still uncommon. However, there is always brisket. When brisket is offered it comes with options of lean or wet. Go with the latter. It is tender, moist, flavorful and you won’t gag on it because lean brisket is so dry. Pork of course is the meat of choice. It is tender and full of flavor as well as tender. 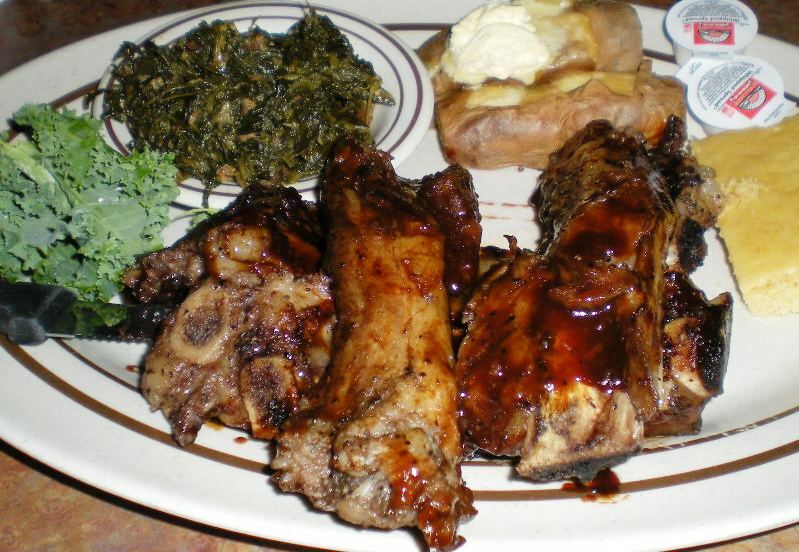 My taste buds salivate just thinking about delicious ribs, chops or ham. 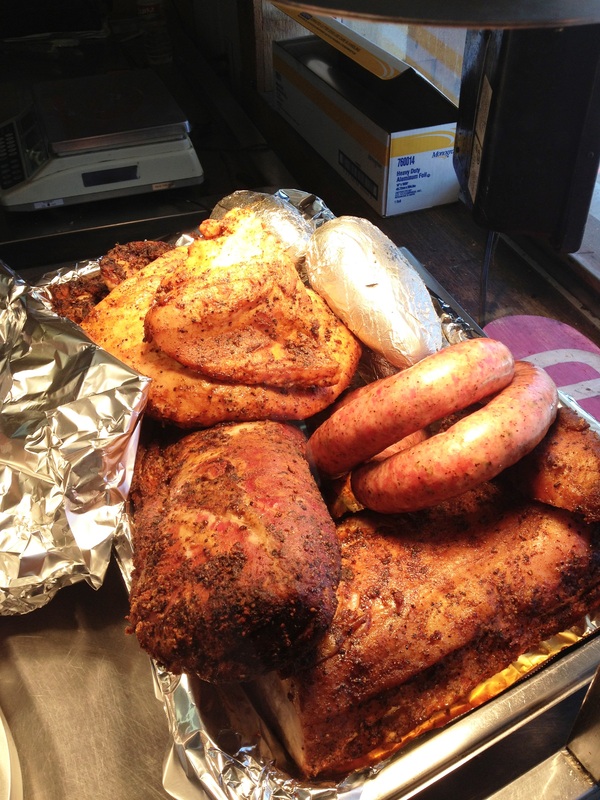 There is another choice of pork that is as versatile as any BBQ menu selection. It is pulled pork. Flavor is always amazing. Moisture and tenderness are rarely a disappointment. Last week I decided that pulled pork was so good that I was going to make it myself. Yes, I watched a video or two. Also, I read up on it in my BBQ cook book. For five hours I smoked a whole piglet on my grill. On low heat, 200 degrees, I let the steady heat cure the pork with a perfect red band. Now, the work would begin. Inside of our kitchen I laid the pieces of pork out on a chopping board. Carefully I separated the main parts of the pork. The aroma was killing me! To quench the craving I ripped off a piece of hot juicy pork and popped it into my mouth. It was delicious. Before I could go on I closed my eyes and slowly chewed on the product produced in my own backyard. I let the pork cool a bit so that my fingers would not burn. Then, with methodical care I pulled pieces of pork off the bones. Once hunks of meat were removed, I shredded the pork chunks into strips. Our kitchen was filled with great aroma. Mounds of freshly smoked pork were pile high in different bowls. I would make sandwiches, tacos, breakfast sides, lunch entrees and dinner main courses from this store of prepared food. Each time the tender bits and flavorful mouthfuls made me smile. My bride and I marveled at the fun it was to have a week’s plan of meals all scheduled out after a weekend of preparation by a labor of love. I sure am glad that God gave us tastebuds! Of course I am talking about learning to smoke on our new grill. What other smoking could there be? This is a good kind of learning. I read the instructions that came with our grill. Clearly the instructions matched what the salesman promised me. I could smoke as well as grill on this versatile unit. In the past I have failed and succeeded with efforts to smoke a delicious meal. Once I did a turkey and it was an instant family hit. That memorable meal was a great event because it was never to be repeated. Part of the problem was the smoker. It was constructed out of aluminum skin walls. During my subsequent smoking attempts, the cold outside weather made it impossible to control the temperatures. I threw the bird away after hours of smoking. 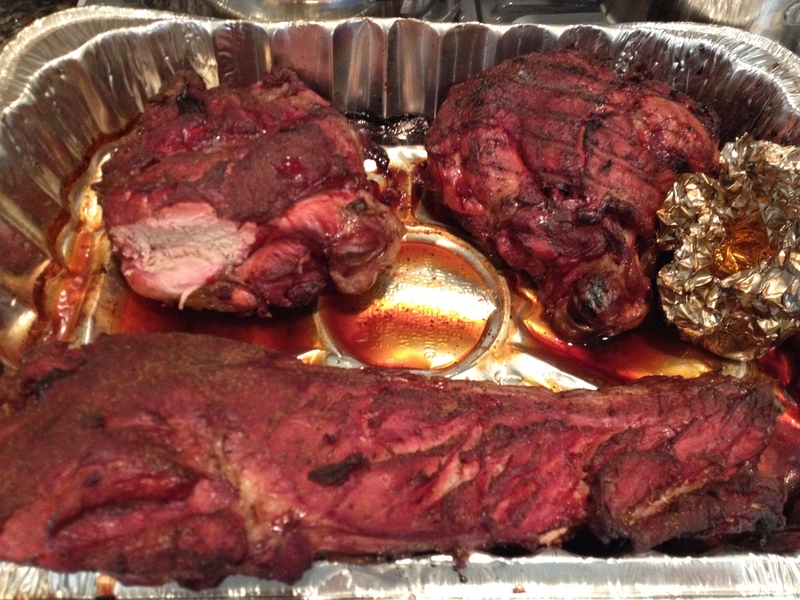 Friends have used insulated walled smokers with consistent and amazing results. I did not just envy their culinary skills, I salivated as I indulged on their pork ribs, brisket and chicken. How was it possible for average guys to prepare food good enough of a classy restaurant? Common among these grill masters is the same advice. Temperature control is key. 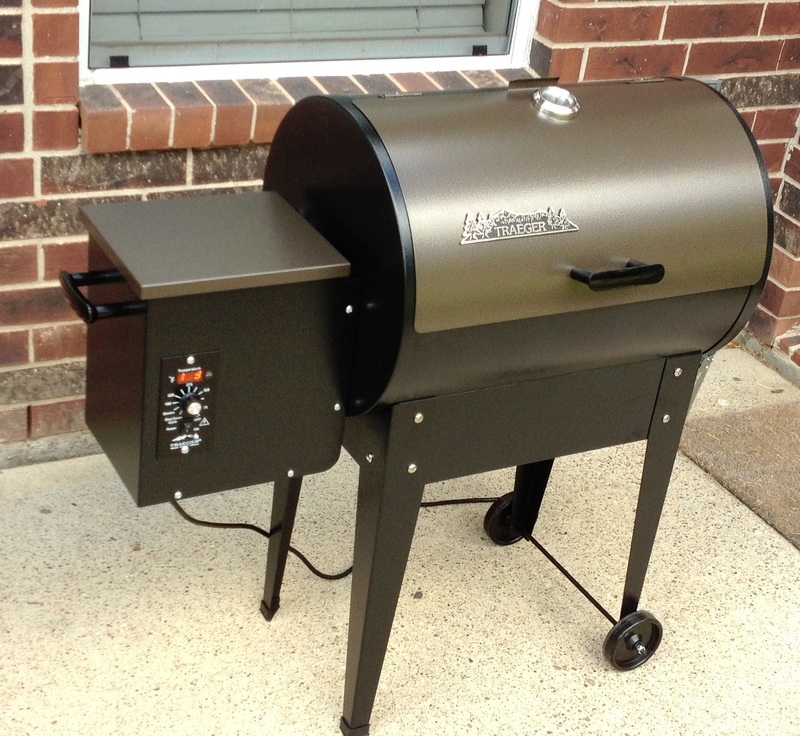 If you can get a grill or smoker that can finesse the heat, then smoking successfully will be a fulfilling promise. Then, after turning my back on charcoal grills and propane options and expensive dedicated smokers, I was introduced to wood pellet grills. This was my entrance into great outdoor cooking for foods that I wanted to serve to my family. Admittedly, I swallowed hard when I was about to smoke my first batch of wild Texas pork. A lot of effort went into harvesting these BBQ delights. Now, with a strong desire to smoke the meat but with a track record of horrible failures, I was reluctant. I prepared the meat with the mental note that “butchering” may well characterize my lack of ability in trimming the roasts and ribs. Oh well, my forgiving wife would appreciate my good intentions. That was my hope anyway. 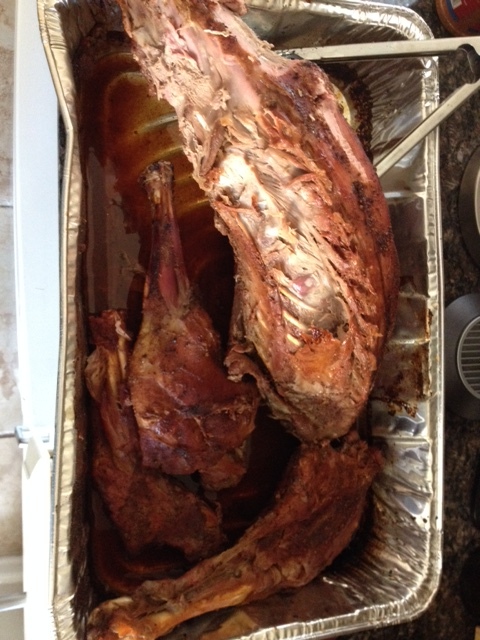 For nine hours I smoked these large chunks of meat. I followed the instructions. Afterall, I read them over and over again. Finally, at 6pm I served the fare. My bride and I both smiled, expressed amazement at the delectable results and looked forward to many more repeats of a system that made a smoking BBQ novice like me a success on the culinary path of outdoor cooking. Miracles do still happen! We have been living in Texas now for over a year. Before we moved to our newly adopted state we divested ourselves of as much stuff as possible. So many of those items were a part of our lives and we miss them. One item that we gave away was our BBQ grill. Sigh. Cooking over a grill is a thrilling part of a daily chore that puts a lot of fun into one of life’s inevitable chores. Cooking is a necessity so we might as well do it over an outside grill. When we grill up a stack of burgers for our guests, the football game is better. Franks or sausages on the grill make church gatherings in the home especially fun. A quiet meal for the family with thick steaks sizzling on the barbecue will put a photo in the album. It was time for us to pick out our next grill. To make it the best choice possible, I read, shopped and asked a lot of questions. One of the features that I was hoping to find was a way to do some smoking. Smoked meats have been given to me by great BBQ chefs and I was hooked. Whether it was ribs, brisket, sausage or chicken I loved the taste. When the entrees are served with mouth-watering aromas and the juices are seeping out of whatever you are served, who could not be moved to want to put that kind of culinary skill into a loving meal? Good smokers with insulated walls are not secured with pocket change. My budget did not give me that freedom. There were a few other important ideas floating around in my decision-making tree as well. I toyed with a return to the briquets in a spherical grill. Yet, the health benefits of avoiding fuels that send not-so-tasty particles into the food made me hesitate. Gas grills are common, inexpensive and filled with every imaginable option that you could want. Nevertheless, propane gas fires do not add much to the flavor of the food. I was looking for an alternative. I was introduced to wood pellet grills. 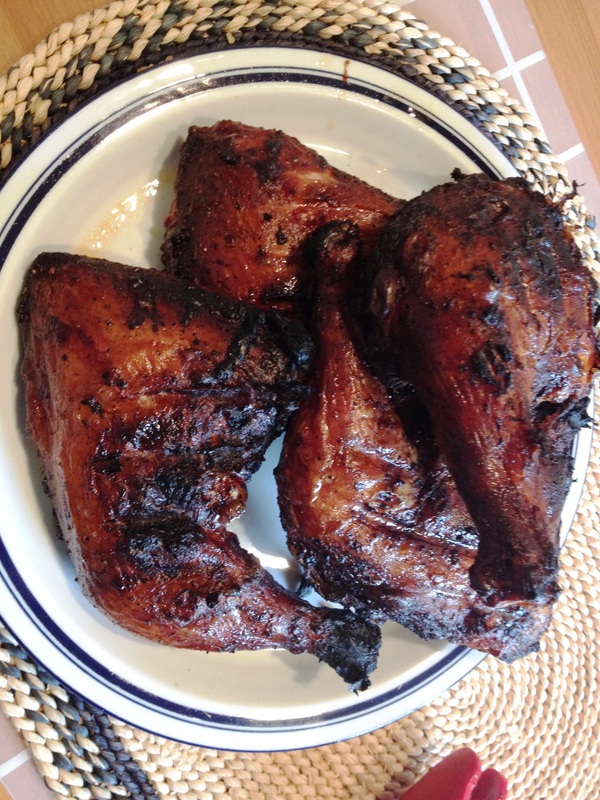 Simple, fast, flavorful and smoking meats was a huge option. Clean burning hardwood pellets left clean up a breeze and the healthy option a reality. It was Labor Day. Grilling is a featured part of this holiday. Sales were all over the internet. We made our choice. Our first BBQ meal as Texans was a resounding success! Yum! 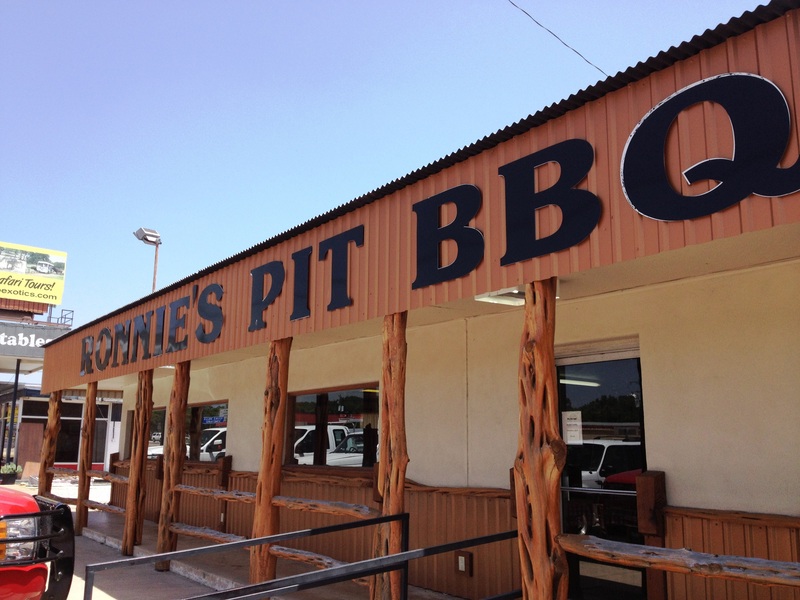 When you’re in Texas, you have to schedule at least one meal at a BBQ joint. 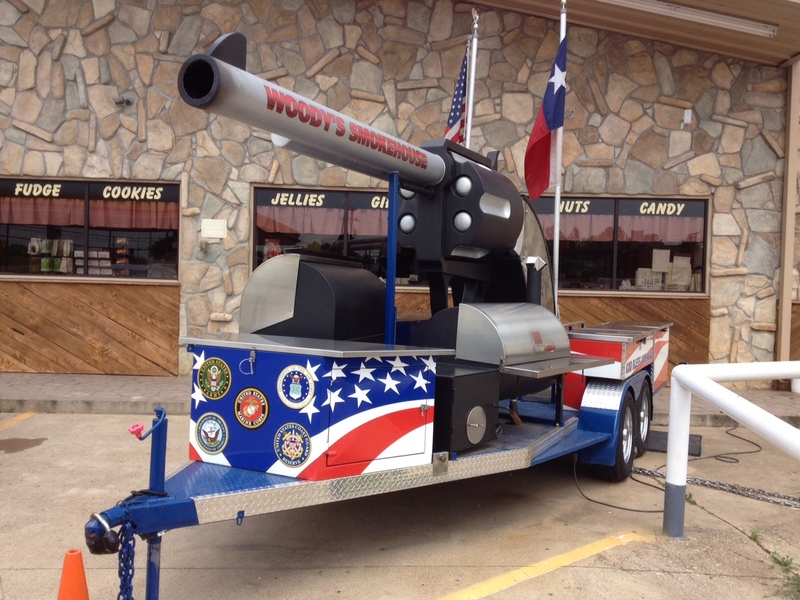 Texans have a way of putting ribs on a grill and making the mouth of the most discriminating taste water up a tsunami. They have been doing for so long and they pride themselves in this culinary delight. In addition to pork ribs, they also waft the olfactory nerves with the aroma of perfectly smoked brisket. This cut of beef is tough, undesirable but amazingly transformed by the knowledgable Cowboy grill master. The coloring is amazing and your mouth waters uncontrollably when you get close. Sausage is a winner too. The sweats on a link of Polish or Brats signal that it’s time sit down for dinner. They are juicy, succulent and flavorful. Add some baked beans, slaw and okra and the meal makes a perfectly balanced presentation. It tastes great too. Locals directed us to a nearby BBQ favorite. We ordered our meal and sat down. Then, I paused not only to thank the LORD for the meal, but also to take in the surrounding ambiance appropriate for our dining pleasure. Scenery helps the experience of dinner very special. On one wall there is a row of amazing elk heads. They are shoulder and head mounts. Their racks are stunning. 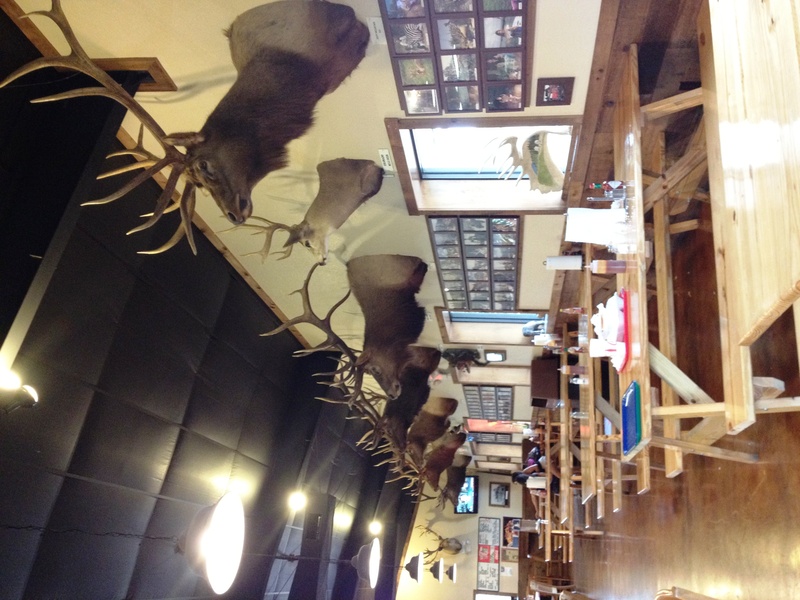 Interspersed among the elk are deer heads, game fish replicas and varmints of every kind. Another wall had a young bear climbing through the limbs of a tree. Then, to top it all off there was a full mount of an 8 foot tall grizzly on its hind legs challenging the world. A moose head with a representative set of antlers welcomed guests at the front door. A few game birds were also mounted to give the royalty of the air some space as well. Then, taking up its appropriate space was an American Bison in all of its shaggy glory. But, I had to laugh at the central decorative piece. It was a mastodon. The shaggy head of the ancient elephant was massive. The BBQ sauce had some kick to it. Every one of the pork ribs was tender and juicy at the same time. That is what good grilled food tastes like. Put it all together with the beautiful company of my bride and it was a perfect man’s night out. Great food, fabulous wife and amazing trophies from someone who Biblically subdued the earth make for a perfect evening in Texas. When Yvonne and I packed up our stuff in Michigan and made the big move to California we remember some of the stuff that we left behind. It was tough to part with things that made memories. A BBQ grill is one of those worldly things that make great memories happen. The fragrance of a smokey aroma enhances Spring days. It defines the summer months. It even helps us close out Autumn, declaring the coming of the season of Winter. Diehards attach their grills to their pick-up truck tailgate. Football season takes on a community experience when the grill is fired-up and cooking begins. That unit limited to this world breeds great experiences in life. 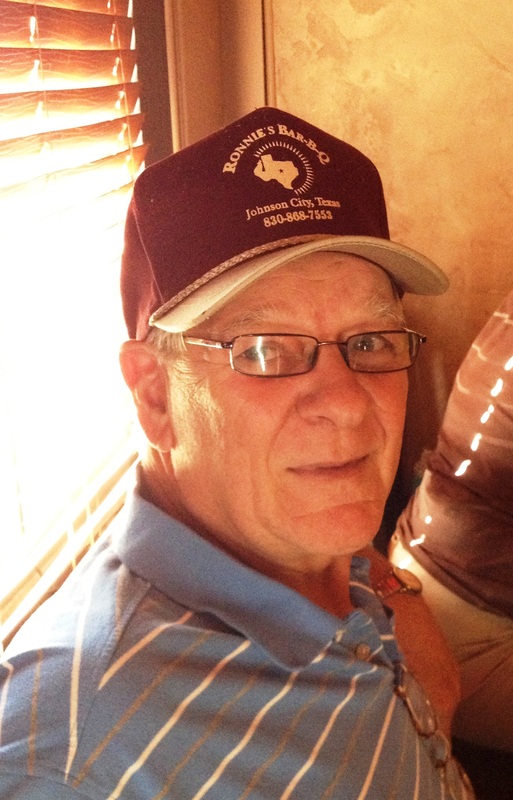 Laughter, smiles, conversation, teasing and relaxation are all a part of what BBQ experiences are all about. It is the grill unit that takes center stage as a facilitator, a centerpiece or a connector for the gathering in our lives. For over a year we have been without this piece of life. We left our grill back in the Midwest. Someone else is enjoying the benefits of new experiences and memories that it brings. For a year we had no access to a yard, a San Francisco compromise for so many. Now, we are renting a house. We now have a backyard to use! It’s time to get a new grill. There are so many choices. I went to a home improvement store. Several brand names with various models filled up the floor. Prices match options and features. Styles are similar but the knobs, percentage of metal and dials all add to the unique aesthetics of the unit. But, can the thing cook? Big is not what I need. 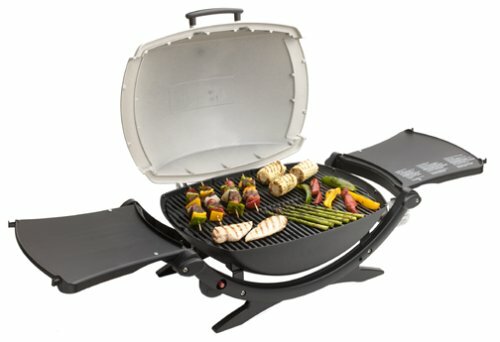 In fact I like a grill that is more suited to cooking for my family of seven than scores. Something durable and easy to clean make sense to me. All of our lives we have moved more than the average person. That way when we move again maybe just maybe we can take our next grill with us. It gives some stability to life. When the kids are coming over it’s time to take the wonderfully marinated entrees that Yvonne creates and toss them on the grill. Sweet smelling smoke starts the taste buds tingling. Family gathers, I thank God for His provision and we dig in with new memories with each savory grilled-to-perfection bite.